Add World of Sports to your favourites! Meet the best-in-class hard hitter. Anatomically moulded for supreme comfort and maximum cushioning. 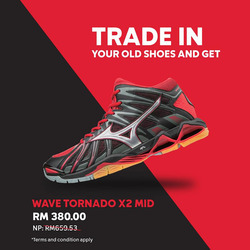 Now you can Trade In your shoes and get Mizuno Tornado X2 Mid for RM380 only. Promotion valid while stock last. 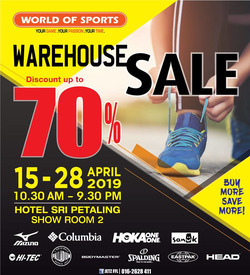 The World of Sports (WOS) provides a comprehensive range of sporting products and equipments, and related accessories for a wide range of sports to cater to the growing numbers of sports-lovers and fitness-conscious Malaysians. World of Sports retails most of the branded sporting goods, apparels and equipment such as Mizuno, Head, Columbia, Hi-Tec, Teva, Salomon, Keens, Keds, Elle Active, Reebok, Puma, Nike, Adidas and many other active lifestyle sporting products/ accessories. Follow World of Sports Malaysia on Facebook for all the latest product updates, events and promotions. 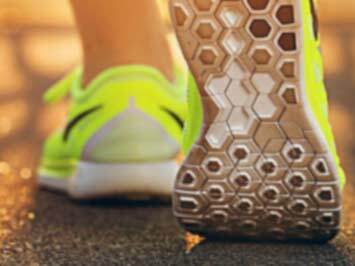 Among the areas that World of Sports products cater for are road & trail running, adventure racing, hiking, swimming, racquet sports, water sports, lifestyle activities and more. World of Sports was incorporated in 1992. There are currently 9 stand-alone World of Sports outlets and more than 12 sport consignment counters in leading departmental stores around the country. 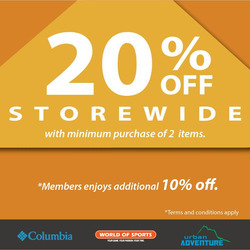 Stay tuned for announcements of World of Sports warehouse sales which offer huge discounts and savings on a variety of products.